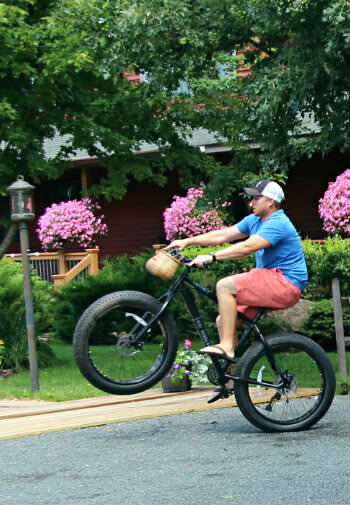 Use our Fat-Tire Bikes on our private bike trails. We have enough mowed trails that no one has ever covered them all in a day, not on foot, on a golf cart or on a bike. These bikes, with their low-pressure tires, are perfect for our trails, summer and winter. Bring your bikes (we have inside storage). Ride on Burnett County’ paved township roads located just across the St. Croix River from Woodland Trails. We have two special bike routes laid out for your enjoyment. One is an 8-mile tour over Rustic Road 98 featuring lakes, modest hills, curves, and endless scenery. The other is a Round Lake 14-mile tour. For the ambitious, the two routes can be combined for a day-long adventure. Rent bikes from Cog and Sprocket Bike Shop in Webster. From their shop you can get on to the Gandy Dancer Trail over the old Soo Line Railroad line. The trail is surfaced with finely crushed limestone. From Webster you can go 8.9 miles north to Danbury or as many as 40 miles south through Siren, Frederic, Luck, Milltown, Centuria to St. Croix Falls.